Discussion Between – Jobber & Broker. Discussion – Jobber and Broker – HSC Board – Easy way to learn and memorized – class 12th – S.P – Notes of Introduction to Stock Exchange – Difference between Jobber and Broker , Distinguish between – Introduction to Stock Exchange – Secretarial Practice – Notes, & Distinguish Between – according to the New Textbook for HSC Board –Difference between, Study material, studies notes, study notes. 1. 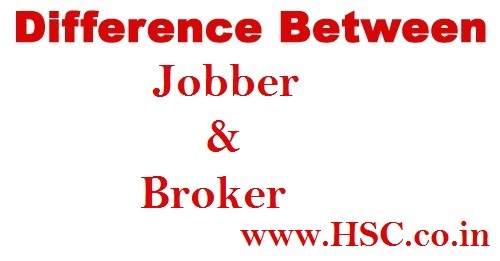 Meaning Jobber is a dealer who deals in buying and selling of securities. Broker is an agent who deals in buying and selling of securities on behalf of his client. 2. Nature of trading A jobber carries out trading activities only with the broker. A broker carries out trading activities with the jobber on behalf of his investors. 3. Restrictions on dealings A jobber is prohibited to directly by or sell securities in the stock exchange. Also he cannot directly deal with the investors. A broker Acts as a link between the jobber and the investors. He trades i.e. buyers and sells securities on behalf of its investors. 4. Agent A Jobber is a special mercantile agent. A broker is a general mercantile agent. 5. Form of consideration A jobber gets consideration in the form of profit. A broker gets consideration of commission or brokerage.